Are you really saying that motorbikes and scooters are like cars? What would be the reason why one uses a motorbike or scooter as a mode of transport? Some will say because they like the feeling of speed, others because it’s cheaper than having a car, others because the use of a motorised two wheeler is more reliable and quicker to take them to their destination. Whatever each of us says, it always comes back to one main reason: with a motorbike or scooter, you’re always on the move by being able to beat the traffic and get to your destination on time, while cars stay behind and sit in traffic for hours. In other words, motorcycles are congestion free vehicles, hence they are the golden transport solution to congested cities such as London, Paris or wherever in the world. But some authorities, whether local or central, don’t seem to realise that motorcycles relieve urban congestion. The key thing to note is that when absurd decisions about motorcycles are made, such as stealth taxing motorcyclists to park in the Central London Borough of Westminster, they are always made by bureaucrats who have not got the slightest idea of the benefits that bikes can bring to the environment. Has Councillor Danny Chalkley of Westminster City Council ever put his arse on a motorbike or scooter? Had he realised how motorcycles benefit the environment, he certainly wouldn’t have so drastically imposed a parking tax on their users to fill up his council’s coffers, would he? Danny Chalkley is unfortunately not the only bureaucrat in the world who fails to recognise the benefits of powered two wheelers (PTWs) on the roads. We have recently learned that a national protest will take place on 13th March 2010 all over France against a Government announcement to increase the number of fines issued to motorcyclists caught to filter through the traffic, especially in a traffic jam situation. La Fédération Française des Motards en Colère, also known as FFMC (the direct English translation being the French Federation of Angry Bikers, which is an on-going and permanent protest group to defend and protect the rights of motorcyclists in France), are calling their thousands of members spread all over the country to join them on 13th March 2010 in a protest to show Michèle Merli, in charge of road safety in France, how stupid and absurd her proposal is. The protest will consist of each motorbiker or scooterist taking the space of one car on each lane of the road, thus creating enormous traffic jams in every French city, which will take hours to clear. To Michèle Merli’s recent message “They [motorcyclists] must not go faster than cars… otherwise they should commute by public transport”, the FFMC’s response is very clear: if you treat motorbikes and scooters like cars, they will behave like cars and cause congestion. The FFMC’s intention is to make the Government realise the absurdity of their proposal by showing them the disruptive effect that it will have on the roads. We must say that we are amused by Michèle Merli’s non-sense statement, which is comparable to one made by Westminster Tory Councillor Susie Burbridge “Being environmentally friendly would be to encourage motorbikers to use more public transport”, as if of course a London double-decker bus did not cause any pollution and congestion at all! We thought we would write a post about this French protest, to not only show the FFMC our strong support for all what they do on the other side of the English Channel, but also because we are amused to see that the No To Bike Parking Tax campaign in the UK is now organising similar gatherings every Wednesday morning in Central London during rush hour to show Westminster Council that, if motorbikes and scooters are treated like cars by charging them to park, they will behave like cars, congest and cause traffic jams all over Central London. It is really sad that educated people such as bureaucrats and other politicians are unable to use their brain to consider the impact of their proposals before implementing them. There’s only one way around this, which is to cause massive embarrassment by showing for real how absurd a decision of theirs can be. Pour la reconnaissance des spécificités des 2RM, mobilisation générale le 13 mars! A mon avis tout le monde qui aspire à obtenir un permis bagnole devraient être obligés de conduire un scooter/cyclomoteur/moto pour une période de deux ans. Il serait de les rendre plus conscients de deux-roues motorisé, d’ameliorer leur sécurité et identifier leurs besoins. Ceux qui accèdent à des postes dans la gestion des transports ne serait pas rêver alors d’une législation stupide comme ça. In my opinion everyone who aspires to getting a car licence should be obliged to ride a moped/scooter/motorcycle for a period of two years. It would make them more aware of powered two wheelers, improve their safety & identify their specific needs. Those who subsequently achieve positions in transportation management wouldn’t then dream up stupid legislation like this. 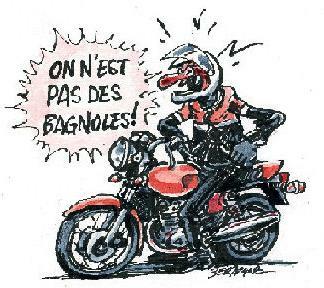 Allez mes amis le 13 mars & de montrer cette dingue pareille, Michèle Marli, ce n’est jamais une bonne idée d’emmerder les scootards et motards en France ou en Angleterre. Moi, je pense que vous avez raison de poser ce manif – bon courage et bonne ténacité. This is a good example of why women should never be allowed into positions of power. Margaret Thatcher being a classic exception.